Since there were only 240 male runners and 138 female runners in the marathon, the 45 seconds it took him to cross the start line would put him right at the back of the field as per his usual MO. Look at the net chip - gun times for the slowest runners. No more than 45 seconds. I think florida oldtimer nailed the reason for Kip's propensity to walk across the finish-- he's afraid his form will unmask him. Nope dude, this guy (Oscar) already brought it up. Not being a d##k, but it was brought up. With all of the posts, you guys are missing more than you think. I agree, it's Kip or his twin. Remember all those detective shows you've watched over the years? The detective always thinks like as if they were the criminal. Aside from the why (probably need a medical degree for that one) how would he be trying to pull all this off. Think like him in other words. I think he has help in some way. 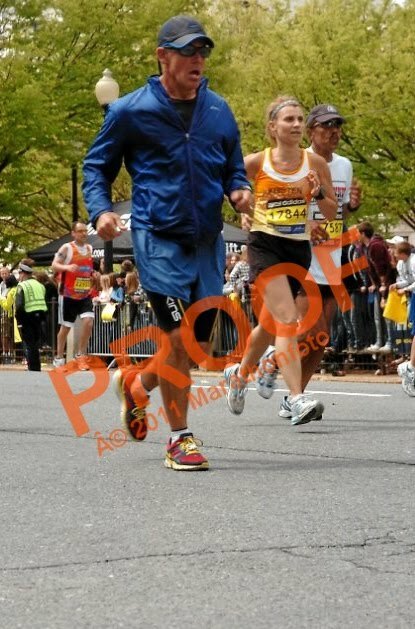 I'm working on the "raincoat Kip" from Boston but could use some help going through the all the photo's. Summary: 2:55:45, 5th place overall, 1st or 2nd master (depends on whether 4th place Todd Arndt is age 38 or 40); website mentions awards for top 3 masters, but no specifics. Suspicion #1: Multi-loop course; apprears to offer several places to cut, no split times in results. I have emailed the race director (generic "contact us" from the race website), alerting them to the concern and directing them to the blog and this thread. I will post if I receive a response. I'm so mad at myself. I remember seeing another picture of the "raincoat Kip" in all those photos I went through, but I skipped over it, thinking "nope, that can't be him". I think I burned out my retinas staring at the screen... can't face it again yet. Let's not forget that at some point Kipper has to go back and get said bicycle. Easier to take the T back past the last place he put the bike and run back with the slower crowd to get to that spot than run against flow of people. Why is it I can't stay away from this thread??? Must put it down. Must turn away. Must get a life. Must...oh wtf. Who's got the next piece of evidence? What about the detroit marathon relay where he got his team (that otherwise would have finished 2nd or 3rd I believe) DQed. I think one of the previous threads said he ran (or rather was supposed to run) the second leg. that leg starts around mile 6.5, finishes around 12, there are mats at around 8 and around 9 at the beginning and end of the tunnel. it would be really easy to cut any portion b/w 9 and 12 but i thought the prior thread said his splits at the tunnel were missing or there otherwise was something funky in that first portion of the leg. the only way to cut the first part of that leg is to drive over the bridge. given closed lanes on the bridge, customs etc. it would surely take longer to drive the long way than to run through the tunnel. have i got the basic facts right? did his team/the race ever figure out how/where he cut? any one with first hand knowledge of what the deal was? or maybe he took a boat across the river? given the complicated schemes in other races i wouldn't rule this out. Given his furtive, rat-in-the-shadows behavior, he is NOT a Dean K-type attention whore. No entourage, no fanfare, not a sign of any friends or even his wife at the end of the race, just slipping in and out as inconspicuously as possible, trying to hit the mats, getting the numbers right thane hightailing it out. If he was planning a future of a book, speaking tour, etc., we would see more evidence of documenting with photographers instead of avoiding them, we would see some film-making, that sort of thing. I am getting the vibe of a pure compulsive cheater, like the rich guy who compulsively shoplifts for the rush, the guy with the beautiful wife who cheats with much less attractive women, and so forth, all for the challenge and the buzz of being a near-criminal, but in this case not quite doing anything actually criminal (unless fraud comes into this with the charities). I have no doubt that Kipper himself is getting a good hit off of this thread, even as the noose tightens on his little escapade. Would you pay $20 for a book written by Kip that talked about the hows and the whys. The profit would go to him.